CARACAS, Venezuela — With her youthful energy and globe-trotting, the 26-year-old wife of Venezuelan opposition leader Juan Guaido is emerging as a prominent figure in his campaign to bring change to the crisis-wracked country. Fabiana Rosales’ age and informal dress, often jeans, while touring Latin America belie an inner toughness and maturity cultivated with her activist husband during violent street protests in Venezuela’s capital. Her husband has since claimed Venezuela’s interim presidency with the support of dozens of nations including the United States, setting up a standoff with President Nicolas Maduro, who refuses to step down amid what he calls an attempted coup. “I don’t want my daughter to grow up wanting to leave Venezuela,” she said, a reference to the roughly 3 million Venezuelans who have fled their country amid a collapsing economy, hyperinflation and shortages of food and medicines, and now blackouts. As her husband leads efforts to remove Maduro through protests at home and by trying to persuade Venezuela’s military to abandon the socialist leader, Rosales is trying to drum up international support for Venezuela’s beleaguered opposition with highly publicized tours of neighboring countries. This month she traveled to Peru and Chile, where she met with the presidents of both countries, and spoke in universities about Venezuela’s humanitarian crisis. On Wednesday, Rosales heads to the White House, where she will meet with Vice President Mike Pence, as the U.S. ratchets up sanctions on the Maduro administration. Rosales met her husband at a youth rally for Voluntad Popular, an opposition party she has worked with since her university years. She has become a household name in Venezuela in recent months, standing at her husband’s side in rallies attended by thousands. Recently, she has also taken on the role of international ambassador for Venezuela’s opposition, as her husband becomes bogged down in domestic affairs. Venezuela’s first lady in waiting has helped her husband look more presidential, says Dimitris Pantoulas, a Caracas-based political analyst. Guaido declared himself Venezuela’s interim president in late January. The opposition leader was serving as the president of Venezuela’s Congress, and said the constitution allowed him to form a transitional government because Maduro had been re-elected in a sham vote last year. In her recent trips abroad, Rosales has met with large crowds of Venezuelan migrants, urging them to keep their faith in her husband and telling regional leaders that “a dictator” like Maduro does not fall in a matter of days. She says the Venezuelan opposition is making progress, designating ambassadors around the world, and recovering control of Venezuelan oil assets abroad with the help of the United States. 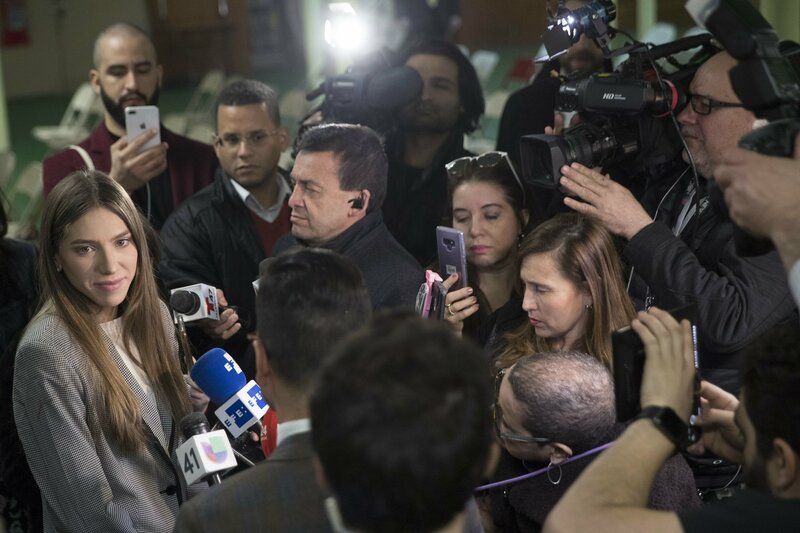 Rosales’ opponents have cast her recent tour as a desperate attempt to keep Guaido in the international spotlight, as the Venezuelan crisis drags on and the world’s attention moves elsewhere. “She is trying to boost Guaido’s image, as support for his movement in Venezuela deflates,” Arevalo Mendez, Maduro’s ambassador to Chile, told a local news outlet last week. She decided to follow in her mother’s footsteps and study journalism, but also helped her father transport his crops to Caracas along roads where he was sometimes shaken down by corrupt military guards.